Handling of heavy parts with high cut risks in oily or greasy environment. Shock absorber pad on top of the hand to protect metacarpian and fingers. Nitrile foam provides outstanding grip in wet environments and good abrasion resistance. Rubber reinforcement provides protection from impact hazards to the hands. The inside is knitted, dipped and sewn in one piece for increased comfort and dexterity. Nitrile foam provides outstanding grip in wet environments and good abrasion resistance. Rubber reinforcement provides protection from impact hazards to the hands. The inside is knitted, dipped and sewn in one piece for increased comfort and dexterity. For jobs where workers face hazardous impact risks to the hands. 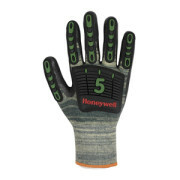 For jobs where workers face hazardous impact risks to the hands.